What Is That Thing That Hangs Down Between a Turkey's Eyes? The fleshy mass that hangs over the beak is called a "snood." Sometimes it hangs so low that it looks like it comes from between the turkey's eyes. It can change colors and size. Both male and female turkeys have snoods, but the male turkey, called a tom, will have a much larger snood. Scientists don't know what the snood is used for, according to the National Turkey Wildlife Foundation. However, it appears to play a role in sexual attraction. 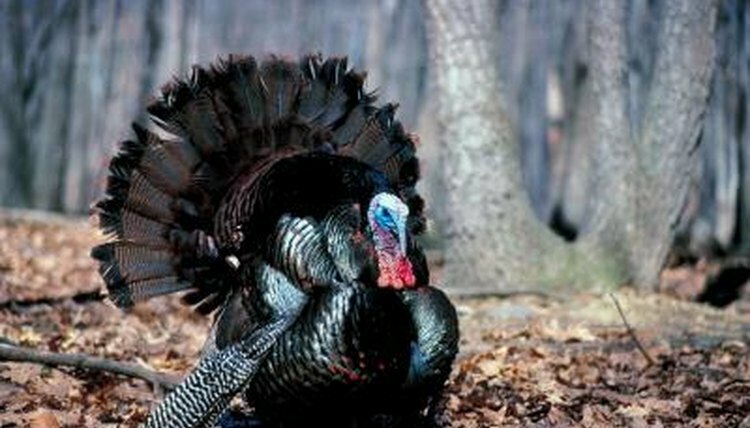 Richard Buchholz at the Department of Biology in the University of Mississippi has studied wild turkey mating habits. He notes that wild turkey females or hens will tend to select wild toms with the longest snoods. Tom turkeys with long snoods may be healthier and more desirable to turkey hens. Buchholz noted that those wild toms with longer snoods had a lower parasite burden than those with shorter snoods. In particular, toms had longer snoods when they had less or no intestinal coccidia. It appears that hens were selecting coccidia-resistant toms to mate with, thus passing those genes along to their offspring. Snoods do help show the turkey's emotional state and health to a certain degree. A sick turkey will have a very pale snood. A turkey ready to mate, aggressive or excited will have a bright red snood. Fearful and relaxed turkeys will have blue snoods. Along with the snood are fleshy bumps on the turkey's head neck known as caruncles. Both toms and hens have caruncles, although the caruncles are more pronounced on toms. They will turn the same color as the snood. NWTF: What Does a Wild Turkey Look Like? What Is the Function of a Rooster's Tail?